Anchor Marine Repair: Your one stop repair shop for all your boating needs. Catchy slogan, right? In our Minnesota boat repair shop, we don’t just talk the talk – we walk the walk. 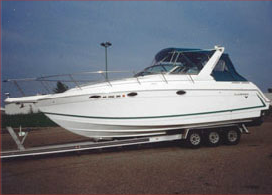 We don’t just say we are your one stop repair shop, we own that we are your Minnesota boat repair shop that can repair all of your boat problems, and give your boat back to you in better than pre-accident condition. Boom. If we had a microphone right now, we’d drop it. Fiberglass, Aluminum, Pontoon, and Jet Ski Repairs are all very different types of boats. You guessed it, we can repair them all. Let us show you how! A boat is a large investment and it takes a lot of maintenance to keep it running smoothly. No matter how well you treat your boat, damages and elements of the water can really ruin it. So whether your fiberglass boat was damaged in a storm while being stored, involved in an accident, or suffering the general effects of aging and weathering, we can help. We specialize in fiberglass repairs, with the ability to fix your hull, finish your wood floors, and even perform transom repair and replacement. Why do so many people around the Minnesota waters have aluminum boats? Aluminum boats are great since they have the ability to resist sun damage, weather damage, and even rot damage! We love aluminum boats! However, when something goes wrong, it’s a complex problem to fix! A boat is a boat and it will have damage. Aluminum boat repairs commonly include leaks in the bottom due to punctures from rocks or sharp objects. For aluminum boat repairs, our Minnesota boat repair shop has specialized professionals that know exactly how to fix your problem, before it gets worse! Being out on a pontoon in the summertime is a memory worth recreating over and over. However, pontoons are notorious for needing repair and restoration. Even if it’s just the carpeting that looks weathered, taking it in for our professionals to look at is a must! Pontoon boat repairs can mean a wide range of things and Anchor Marine Repair can fulfill this range quickly and efficiently to get you back on the water in no time! Our knowledgeable technicians at Anchor Marine Repair understand the unique characteristics that all Jet Skis have. We are educated in all different types of major jet ski brands. For affordable and efficient jet ski repairs, Anchor Marine Repair is the place to turn. For more information about our Minnesota boat repair shop, call Anchor Marine Repair at 763-972-3540 or email us today at service@anchormarinerepair.com.